Who doesn’t love a crumble?! 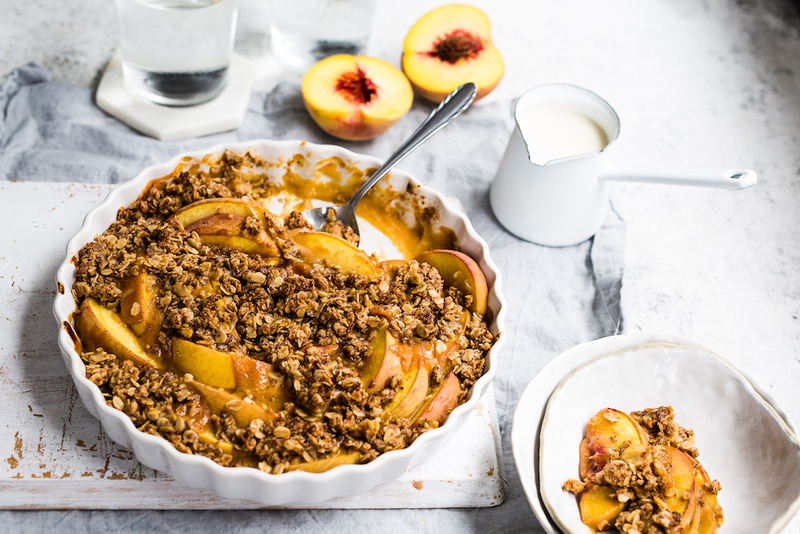 This one is perfect when sweet peaches are in season, and are perfectly married with a crunch, crumbly topping. YAHOO! Truly is comfort food at its finest. 1. Slice 4 of the peaches into wedges and lay into a shallow dish. 2. Cut up the flesh of the other two peaches and pop into a blender with 1 tbsp of the coconut sugar or honey. Blend until smooth. 3. Pour the peach liquid over the wedges to fill in any gaps. 4. In a small bowl, make the crumble by adding the oats, coconut oil, remaining coconut sugar and cinnamon. Using your fingers rub the mixture together until well mixed and clumping together. 5. Dot the crumble mix over the peaches evenly, and bake in a pre-heated oven at 170C for 15-20 minutes or until golden brown. 6. Remove from the oven and allow to cool a little before serving with a drizzle of good quality cream or plain yoghurt. Love it. Pinned to Summer !